One of the chores assigned to me at home is taking out the trash. It’s not a fun job, especially when animals have somehow gotten into the garbage, digging for whatever treasure they can find. Mayday games wants to make that chore a bit more enjoyable with their upcoming Garbage Day game. Today, Mayday Games announces Garbage Day, an exciting dexterity boardgame based on choices, consequences and most importantly- balance. No one likes to be the one to finally take out the garbage and Garbage Day is a battle of wits between you and the other players as you each dodge this responsibility. Between stacking garbage cards and mischief cards onto the garbage can centered on the table, players are sure to use their best judgement about what, where and when to stack their garbage cards on to the already overflowing garbage can. The rules of Garbage Day are simple. Play a card from your hand that either places it onto the garbage can, into your room or into an opponent’s room. When your room is full, you must place all your cards from your room onto the garbage can. Be careful the garbage cards don’t fall or you may end up with an overflow pile of cards. The winner of Garbage Day, and the one lucky enough to kick back and relax, is the last player remaining who hasn’t reached the overflow limit. In the case of two remaining players, the winner is determined by the player with the smallest total size number in their overflow pile. If all players have no overflow and all cards have been placed on the garbage can, then the garbage can wins. 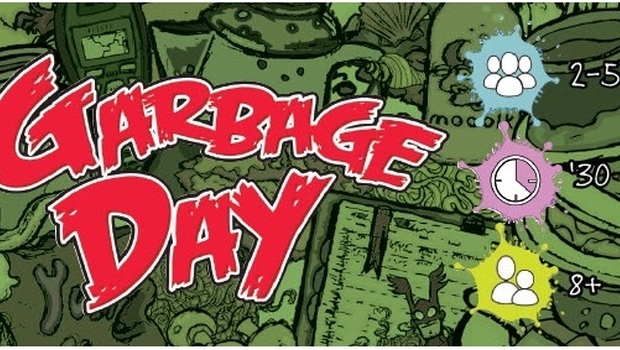 Garbage Day is played with 2-5 players, ages 8 and older and takes approximately 20-30 minutes to complete. Each game comes with 87 garbage cards, 21 mischief cards, 5 room cards and 1 garbage can (we promise it’s clean). Garbage Day is expected to be available Q1 of 2016 but will be coming to Kickstarter in the next few weeks and will retail for $20.00. Mayday had a hit with their dexterity game Coconuts, but this looks like it has a bit more strategy to it than monkeys flinging small bits. It’s good to see dexterity games adding a bit of strategy to them. You can find out more when the Kickstarter launches. Mayday has produced some great games for not a lot of money, so be sure to check it out next month.